FORT WAYNE, Ind. -- As the Fort Wayne TinCaps gear up for Opening Night 2019 at Parkview Field on Thursday, April 4, fans now can look forward to the team's promotional schedule, which was unveiled Thursday. The TinCaps once again will be leading the way in Minor League Baseball with 30 Postgame Fireworks Nights. The team also will continue its tradition of bringing in national entertainers and putting on elaborate theme nights. New for 2019, the TinCaps will have multiple dates for fan-favorite Star Wars Nights, Princess Nights, and Superhero Nights, as well as first-time promotions like The Office Night. See below for the full promotional schedule. Tickets to individual games for the 2019 season go on sale Wednesday, Feb. 13 (8 a.m.) at Parkview Field, TinCapsTickets.com, and by calling 260-482-6400. Fans who purchase their tickets at the ballpark between 8-10 a.m. that morning will be treated to a free breakfast buffet. Season tickets, group outings, and drink-tasting events are already on sale. 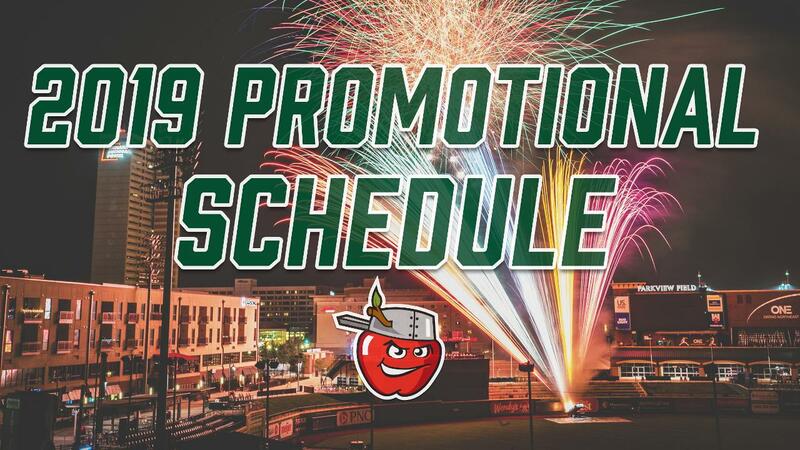 "Promotions are the lifeblood of our success," said TinCaps President Mike Nutter. "We try to make sure each of our 70 regular season home games is fresh, new, and different, while remaining committed to family-friendly fun. That said, we're excited to be offering fans multiple dates for some of our most popular theme nights that often sell out in Star Wars, Princess, and Superhero Nights." In 2018, the TinCaps were recognized by the Midwest League for their marketing efforts and were a finalist for Minor League Baseball's Larry MacPhail Promotional Award. Fort Wayne has been nominated by the Midwest League for this national award six times over the past 16 years, including four out of 10 years at Parkview Field. On top of that, through their first decade at Parkview Field, the TinCaps have earned Minor League Baseball's highest honors for overall organizational success, community service, sustained excellence, and more. Parkview Field has been routinely rated the No. 1 Minor League Baseball Ballpark Experience in the country, too. Fort Wayne's MLB parent club, the San Diego Padres, recently announced the TinCaps' 2018 coaching staff will return this year. The team's Opening Night roster will be set at the end of spring training in March, and, with the Padres having the top-rated farm system in baseball, figures to be stacked with some of the sport's best prospects. The TinCaps' 70-game regular season home schedule runs through Labor Day (Sept. 2). Along the way, the team is home on the Fourth of July, Father's Day, and during the Three Rivers Festival. Click here for the full schedule of game dates and times. Note: All dates and events are subject to change.